Where is this sparrow from? Where does this sparrow fly from? Ona leti od Beograda do Londona. It (she) flies / is flying from Belgrade to London. Ma neee, ona leti od Afrike do Evrope. Nooo, it flies/ is flying from AFrica to Europe. These kids have no clue!!! Ona leti od kuće do reke. It flies/ is flying from the house to the river. It's really complicated. Does anyone know the answer? 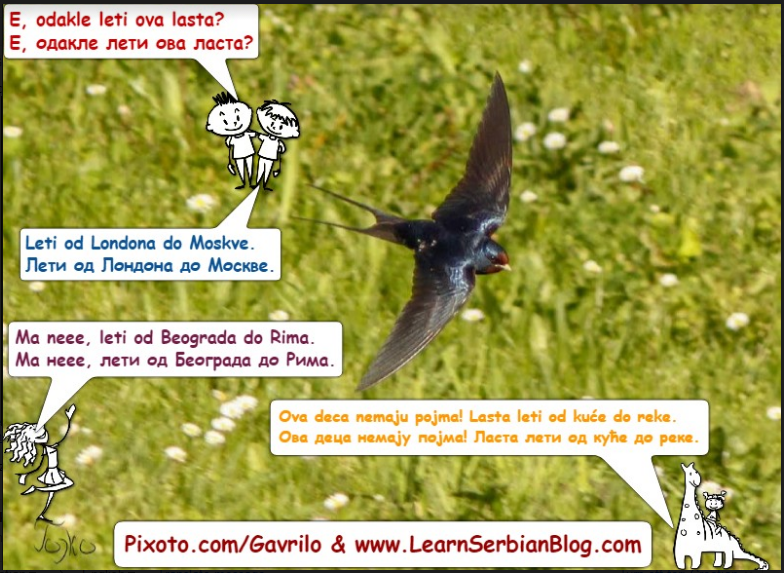 I think there is no correct answer, but we can enjoy learning Serbian by playing with this sentence using the Genitive case. If you are wondering who took this wonderful photo of a sparrow, OR "Od koga je ova slika? ", let me tell you that the author is Gavrilo! He has been my dear friend since forever and he has allowed me to use his beautiful photos in my photo lessons of Serbian. He is doing a great job promoting Serbia and its beauties and I invite all of you to thank him on his Pixoto page by liking and leaving comments under his photos :) Хвала Гојко!